To help the container industry navigate through the changes that it will face, TT Club and McKinsey undertook a joint research project. In the report, 'Brave new world? 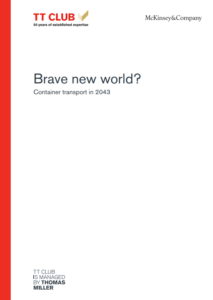 Container transport in 2043', they imagine four possible versions of the future, which are built on different answers to some of the uncertainties, and ask what they mean for the industry. Commercialised in 1956, the container’s simplicity and modularity has made it the preferred means for transport of many goods from one place to another. Namely, containers transport 23% of dry seaborne trade tons and close to 100% of everyday goods like televisions, toys, and clothing. 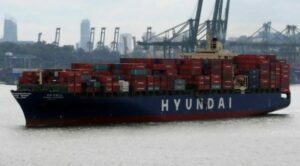 Consumers have benefited as the real cost of transporting goods has fallen, but the success of the container has not always guaranteed the financial success of the industry behind it. Returns for the average container liner operator, container terminal operator, or freight forwarder have lagged the cost of capital over the last twenty years, with only a few players managing to find a sustainable recipe for value creation. Digital, data, and analytics will fundamentally shift the sources of value creation; and the industry-leading players of 2043 may well look very different from today’s leading companies (though they may be the same or similar companies). Who 'wins' - e.g., how can today’s industry leaders evolve to capture the opportunities, will players become more vertically integrated, or will “digital natives” including start-ups and/or e-commerce firms reshape the industry. 'Peak container' and consolidation imagines a future in which trade wars, geopolitical tensions, and “near-shoring” result in the peaking and absolute decline in international trade, forcing players to further consolidate. Preparing for such various results would be taxing for even the most agile and foresighted of companies. Nonetheless, there are some 'no regret' moves that industry actors could adopt to ensure flexibility in the future. These include paying more attention to the dynamics around the end-consumer, especially with e-commerce disrupting retail and lastmile logistics, building organisational discipline around monitoring the 'trigger points' behind different futures, and digitising and automating quickly.